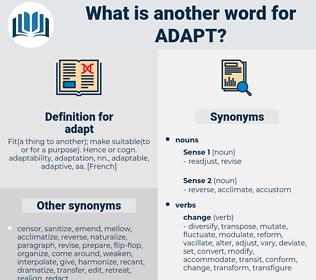 What is another word for adapt? rolling over and play dead. align, alter, conform, amend, convert. GIS, Amending, realign, fine-tune, align, comply, harmonize, modulate, integrate, alter, evolve, conform, amend, convert, address, transform, harmonise, react, incorporate, individualize, accept, correspond, translate, cater, coordinate, transpose, reorient, prepare. adaptable, responsive, tailor, tailored, attuned, adaptive. 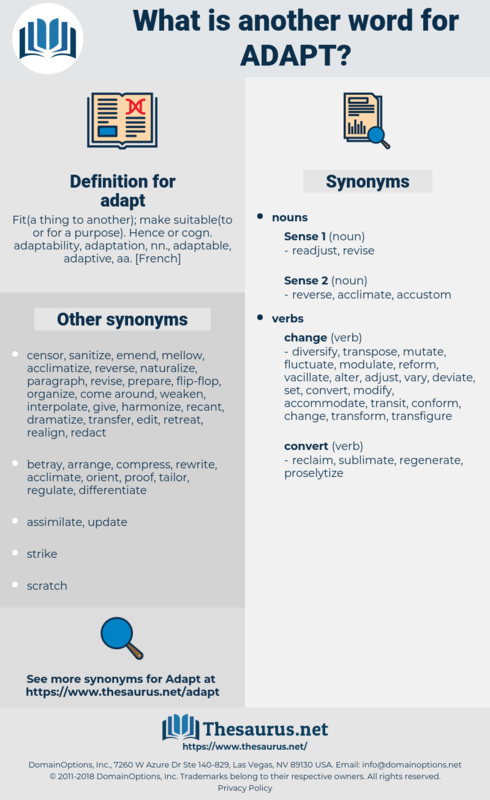 cope, adaptation, update, tailor, restructure, adaptive. The truth, I take it, is that we, all of us, soon adapt ourselves to the circumstances around us. Her glorious voice had lifted her from grinding poverty and obscurity, her quick mentality had enabled her to acquire much, to adapt herself, with more than fair success, to her new environment. adapted, adopted, adoptee, adapid, at-bat, adopt, autophyte, adept. shoehorn, pitch, tame, fit, match, naturalise, acclimate, anglicise, acclimatise, anglicize, focus, obey, readjust, assimilate, Christianize, gear, orient, domesticate, cultivate, naturalize, readapt, wire, tailor, adjust, transcribe, acclimatize, square, electrify, focalise, focalize. change, get used to, vary, alter.